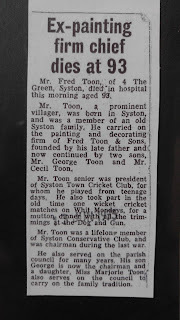 Grandad, Fred Toon (1884-1975), eldest child of William and Annie nee Cook, carried on the business as painter and decorator. I wonder if he had any choice in his career; if it was what he dreamed of becoming, when he was a child? Did he want to do what his father had done, or did he have other expectations, cut short when his father died, leaving him the man of the house? He played cricket on the village team. 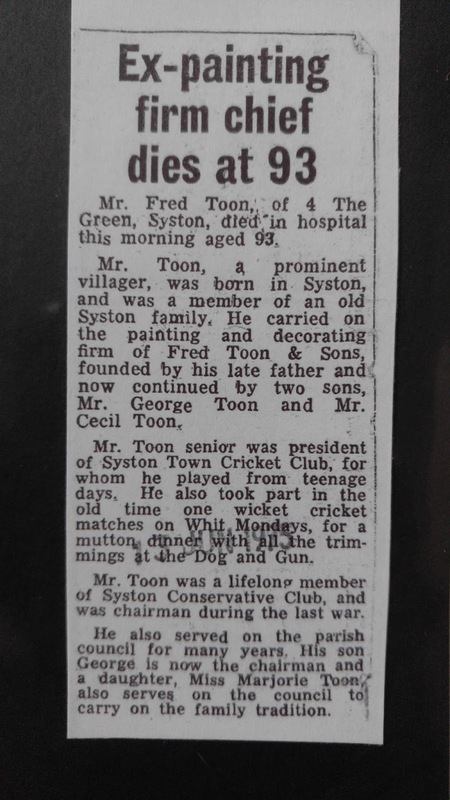 He was a member of the Syston council. He was in the British Army, served with the Wiltshires during WW1. He went to India with the army, sometime between the first and second world wars, leaving his wife Sarah Toon nee Riley at home to raise the children, and then he came back home, and made more babies. There is a photo, somewhere, of Fred Toon in his pith helmet, Army shorts and his ever-present moustache, somewhere near the Afghan border... I'll have to find that one again. Grandad Fred (Frederick) Toon and grandma Sara Elizabeth nee Riley (1882-1962) had eleven children; Edward (Ted) being the youngest, born in 1928, father to my sisters and I.
I always thought of the house on the Green, Syston, as being the Toon family home, because that's where all my childhood Toon memories are, but Ted Toon told us that no, that was only a later house; he and his ten siblings had grown up in a house next to the (newer) Methodist Chapel on High Street, Syston. The house had been demolished, and was once where the Methodist Hall now stands. I found a photo of that house--or rather, the Methodist Chapel historians did, it's on their website, together with a history of all the Methodist chapels in Syston, including the one on Chapel Street where great-grandma Annie was caretaker. The chapels which at one time were considered "dissenting" because they were not Anglican, Church of England--more on that later, in a story about Richard Toon and Syston schools. Fred Toon's and Sarah nee Riley's home was to the left of the chapel in this photo, on the corner of High Street and Upper Church Street, Syston. I wonder if that row of children in front of the chapel contains Toons? Wouldn't that be amazing!